You might call this a 'club' burger - it has an extra bit of bread in between the 2 patties. The McDonald's Big Mac is known the world over and is so ubiquitous that there is an annual Big Mac Index compiled as a crude comparison of countries' economies based on the price of a Big Mac. It's a very cleverly-designed thing that features crunch and squidge, protein, veg and carbs. Divide your minced steak into 4 equal balls. If you want perfectly-formed patties, use a steel cutter, about 90mm - 100mm (3½-4 inches) diameter. Press the meat balls into thin discs. Chop the gherkin into the smallest cubes you can manage. Mix together all of the ingredients and set aside. Peel the onion and slice very thinly, about 2-3mm (1/8 inch), the cut into cubes. Shred the lettuce, about 6mm wide (¼ inch). Carefully slice your buns into 3, horizontally (the heel, club and top, if you're interested). They will need to be lightly toasted on the cut faces before assembly. Spray a little oil in a heavy-bottomed frying pan or skillet. Heat on medium flame, then add the patties. Cook for 2-3 minutes, then turn over. Season the tops with salt and ground black pepper and cook for another minute. If you're using real cheese you might want to heat/melt it before assembly - place a slice of cheese onto a cooked patty and place it under a grill/broiler for a minute or two. Or use a blowtorch. Fake cheese slices will likely melt from the heat of the patty. Take a toasted bun bottom, spread 2 tbsps of burger sauce on it, sprinkle on a teaspoon of chopped onion, then as much shredded lettuce as you like. Place a cooked patty on it, then a slice of cheese, then the middle piece of bread. Top this with more sauce, onion and lettuce, another patty, 3 discs of dill pickle - gherkin - and finally, the lid. The video above is from the Keef Cooks YouTube channel. 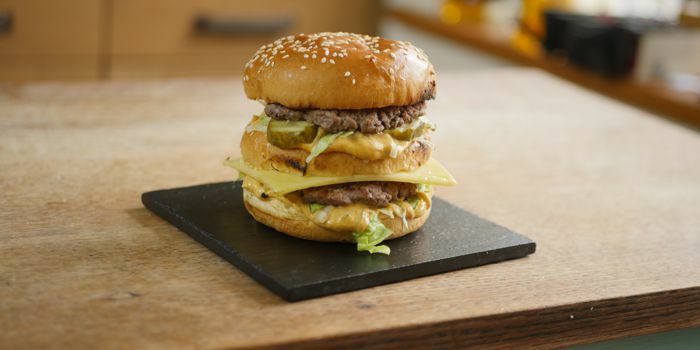 Click here to see the video recipe of Big Mac-style Burger on YouTube. Oil spray for frying. Salt and pepper.